It’s almost Father’s Day (June 18th) and so I put together a fun list of Father’s Day Gift ideas. Plus…drumroll please….there is a GIVEAWAY! Based on his “Fathers” talk, given during the April 2016 general conference, this thoughtful new book contains insights and inspiration about the eternal role of men. Complete with beautiful photography and typography, The Good That Men Can Do uplifts, encourages, and honors husbands and fathers of all ages and walks of life as they share responsibility with our Heavenly Father to nurture His children. Born in Pleasant Grove, Utah, Elder Christofferson graduated from high school in New Jersey, and he served a mission in Argentina. He then went on to earn his bachelor’s degree from Brigham Young University and his law degree from Duke University. Prior to his service as a full-time General Authority of the Church, Elder Christofferson was associate general counsel of NationsBank Corporation (now Bank of America) in Charlotte, North Carolina. Previously, he was senior vice president and general counsel for Commerce Union Bank of Tennessee in Nashville, where he was also active in community affairs and interfaith organizations. From 1975 to 1980, Elder Christofferson practiced law in Washington, D.C., after serving as a law clerk to U.S. District Judge John J. Sirica from 1972 to 1974. Elder Christofferson and his wife, Katherine Jacob Christofferson, are the parents of five children. I enjoyed reading this book to my son. I especially loved that this book was taken from a talk given by D. Todd Christofferson. I loved the quotes, “Fatherhood requires a sacrifice, but it is a source of incomparable satisfaction even joy” and “The Lord expects fathers to help shape their children, and children want and need a model.” Christofferson also spoke about how sometimes despite their best efforts, one cannot fulfill all the duties and functions of fathers. And sometimes fathers may be physically present but emotionally absent, inattentive and non supportive. There are reasons for these type of fathers and it is okay. We all just need to try our best despite our circumstances. Also, one could have a mental illness and it may be tough for them to carry their duties as fathers. I really liked this talk and was glad I read it all the way through. The pictures were well done but I noticed most of the photos were taken from shutterstock. It wasn’t a terrible idea but it just surprised me that Deseret Book didn’t hire a photographer to take photos for the book. Overall, I was pretty impressed with The Good that Men Could do by D. Todd Christofferson and think it would make a wonderful Father’s Day gift. As I was reviewing The Good that Men Can Do, I thought that one could create a fun photo book through Shutterfly to give to their dad. You could put pictures of your dad and fun sayings or you could create short stories from personal talks or testimonies and give them to your dad. He would love to read your own testimony or talk given in church. Another great gift idea for Father’s Day is to have your kids decorate a tie for dad. To decorate a tie, get a plain white tie (polyester or cotton tie). I was able to find one for about $5 on Amazon including shipping. This is a rather economical idea, but if you are looking to give something a little bigger then you might want to check out the Perfect Gift Guide online for more wisdom. You will also need to choose a medium to decorate the tie: fabric markers, crayons or paint. My kids decorated their tie for dad using Crayola Fine Line Markers, 10 ct. I’ve used fabric crayons in the past and they’re not as vibrant and fabric paint seemed too messy for young kids. The fabric markers were vibrant and easy for kids to use. To get started, lay the white tie on a piece of cardboard/newspaper so the marker won’t get on other surfaces. It’s always a good idea to cover surfaces when crafting with kids especially if it’s permanent. The kids picked the colors they thought dad would like and I let them both decorate the tie at the same time. I had debated about letting them each do their own tie, but I figured they might get upset if daddy is not wearing both ties for Father’s Day. Allowing them both to work on the tie, helps them to develop team work and then daddy doesn’t have to choose one tie over another. After they were done coloring, I placed the tie in the dryer on the warmest setting to let the color set. 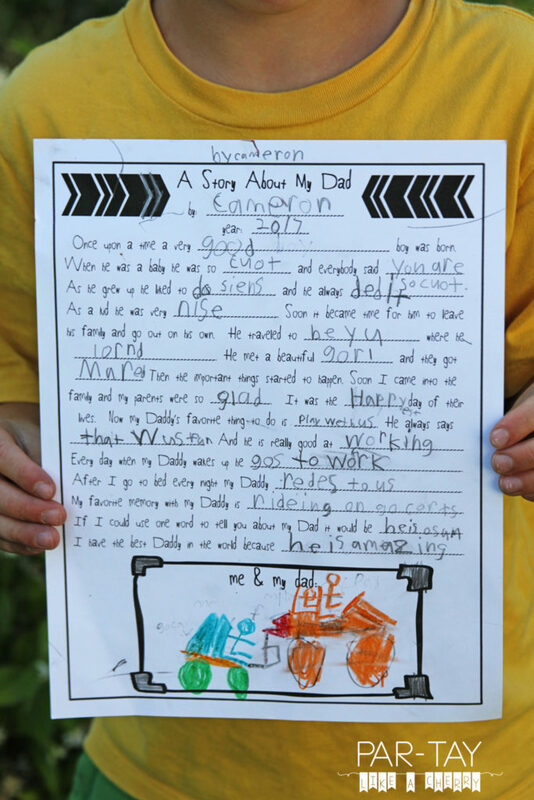 It’s a super, easy craft and a great way for kids to make something special for dad. This is also a great craft to do for grandpas too! There are so many cute Father’s Day questionnaires and fill in the blanks out there! I wanted to make one a little different than what I’ve seen, more of a mad libs style story about their Dad. They might not know about their Dad as a baby, so this can be a good opportunity to call Grandma on the phone and hear some stories! Or you can tell them what you know… OR they can just make it up (which often can lead to the best answers!). To download this free printable just follow the button below, and please follow along on pinterest to make sure you aren’t missing any other freebies! I hope you liked the ideas that we all came up with. There are so many different ideas you could do for small to large budgets. The best gifts come from the heart. I love that we can honor our father’s and tell them how much we appreciate them. What Father’s Day gift will you be giving your father this year? Are you ready for the amazing GIVEAWAY? Again, one reader will win a copy of The Good that Men Can Do by D. Todd Christofferson. I haven’t figured out yet what I am going to give dad this year…. yikes…..
We will be taking him out to dinner! I am sending him a card with a gag gift.